Identification: Weber (1991, 1992) assigned sailfin catfishes to three genera. Armbruster (1997), after a detailed systematic review, placed the genus Liposarcus into the synonymy of Pterygoplichthys. Weber (1992) provided a key and distinguishing characteristics and photographs of specimens; Armbruster and Page (2006) present a revised key to species in the genus Pterygoplichthys (except P. ambrosettii). Native Range: South America: Paraguay, middle Paraná, Bermejo, and Uruguay River Basins (Froese and Pauly, 2012). Table 1. States with nonindigenous occurrences, the earliest and latest observations in each state, and the tally and names of HUCs with observations†. Names and dates are hyperlinked to their relevant specimen records. The list of references for all nonindigenous occurrences of Pterygoplichthys anisitsi are found here. 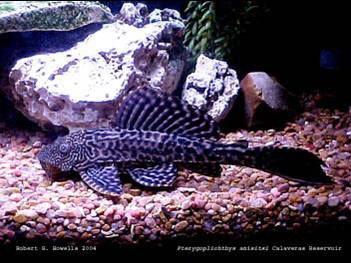 Ecology: Pterygoplichthys spp. can be found in a wide variety of habitats, ranging from relatively cool, fast-flowing, and oxygen-rich highland streams to slow-flowing, warm lowland rivers and stagnant pools poor in oxygen. They are tropical fish and populations typically are limited only by their lower lethal temperature, which has been found to be about 8.8–11 °C in some species (Gestring, 2006). They can thrive in a range of acidic to alkaline waters in a pH range of about 5.5.0 to 8.0 (Mendoza et al. 2009). They often are found in soft waters, but can adapt very quickly to hard waters. Pterygoplichthys spp. also are highly tolerant to poor water quality and commonly are found in polluted waters (Chavez et al. 2006). They are known to use outflow from sewage treatment plants as thermal refugia and can readily adapt to changing water quality (Nico & Martin, 2001). Some species are salt tolerant (Mendoza et al. 2009). Means of Introduction: Probably the result of aquarium release. Status: Reported, possibly established, in a small drainage in Texas. Established in Florida. Impact of Introduction: Largely unknown. In several natural streams in this species is relatively abundant. Because it grazes and removes attached algae, and also feeds on benthic organisms and detritous, this introduced catfish may be having a significant impact on the aquatic food base and, therefore, negatively effecting native invertebrate and vertebrate species (Nico, personal observations). Male members of the genus Pterygoplichthys dig out river banks to create burrows in which an attracted female will lay and guard her eggs. In large numbers, this burrowing behavior by Pterygoplichthys contributes to problems with siltation. In addition, the burrows potentially destabilize the banks, leading to an increased rate of erosion (Nico et al. 2009). Diurnal aggregations of Pterygoplichthys can potentially alter nutrient dynamics by creating biogeochemical hotspots through nitrogen and phosphorus excretion and remineralization (Capps and Flecker 2013). Remarks: Sailfin suckermouth catfishes (Pterygoplichthys spp.) are capable of surviving mesohaline conditions (up to 10 ppt) for extended periods of time, allowing for the use of estuarine and coastal areas for dispersal (Capps et al. 2011). Voucher specimens: Florida (UF 160863; TCWC 11190.03); Texas (UF 111706-709, 114798; TCWC 10815.01, 15176.02, 15176.13). Capps, K.A., and A.S. Flecker. 2013. Invasive fishes generate biogeochemical hotspots in a nutrient-limited system. PLoS ONE 8(1):e54093. http://www.plosone.org/article/info:doi/10.1371/journal.pone.0054093. Chavez, J.M., R.M. De La Paz, S.K. Manohar, R.C. Pagulayan, J.R. Carandang VI. 2006. New Philippine record of South American sailfin catfishes (Pisces: Loricariidae). Zootaxa 1109:57-68. Cohen, K. 2008. Gut content and stable isotope analysis of exotic suckermouth catfishes in the San Marcos River, TX: A concern for spring endemics?. Masters’ Thesis, Texas State University– San Marcos. Cook-Hildreth, S.L. 2009. Exotic Armored Catfishes in Texas: Reproductive Biology, and Effects of Foraging on Egg Survival of Native Fishes (Etheostoma fonticola, Endangered and Dionda diabolic, Threatened). Master in Science Dissertation. Texas State University– San Marcos. 63 pp. Gestring, K.B., Shafland, P.L. & Stanford, M.S. 2006. The status of Loricariid catfishes in Florida with emphasis on Orinoco Sailfin (Pterygoplichthys multiradiatus). Abstracts for the 26th Annual Meeting of the Florida Chapter American Fisheries Society. Mendoza, R.E. ; Cudmore, B.; Orr, R.; Balderas, S.C.; Courtenay, W.R.; Osorio, P.K. ; Mandrak, N.; Torres, P.A. ; Damian, M.A. ; Gallardo, C.E. ; Sanguines, A.G.; Greene, G.; Lee, D.; Orbe-Mendoza, A.; Martinez, C.R. ; and Arana, O.S. 2009. Trinational Risk Assessment Guidelines for Aquatic Alien Invasive Species. Commission for Environmental Cooperation. 393, rue St-Jacques Ouest, Bureau 200, Montréal (Québec), Canada. ISBN 978-2-923358-48-1. Nico, L. G., and R. T. Martin. 2001. The South American suckermouth armored catfish, Pterygoplichthys anisitsi (Pisces: Loricariidae), in Texas, with comments on foreign fish introductions in the American Southwest. The Southwestern Naturalist 46(1):98-104.